Winnie the Pooh quotes are popular with folks of all ages. A.A. Milne’s Winnie the Pooh character has long been a favorite with fans. Pooh Bear has been a part of the childhood of more than one generation. The character has evolved out children’s stories and has gone on to inspire many books explaining sophisticated philosophies. Many others have used the famous character to explain a wide range of philosophies in their works. The Winnie the Pooh character has often been associated with love, care, friendship and the simple pleasures of life. His importance and relevance has continued to evolve over the decades. It wouldn’t be wrong to claim that he will continue to entertain and inspire millions in the future. Here are some innocent, beautiful, and funny Winnie the Pooh quotes for you. Some of these quotes can also hold deeper meanings and can get you thinking. Treasure the moment. It is more fun to talk with someone who doesn’t use long, difficult words but rather short, easy words like What about lunch? When carrying a jar of honey to give to a friend for his birthday, don’t stop and eat it along the way. I wish Pooh were here. It’s so much more friendly with two. If ever there is tomorrow when we’re not together… there is something you must always remember. You are braver than you believe, stronger than you seem, and smarter than you think. It’s always useful to know where a friend-and-relation is, whether you want him or whether you don’t. I used to believe in forever . . . but forever was too good to be true. 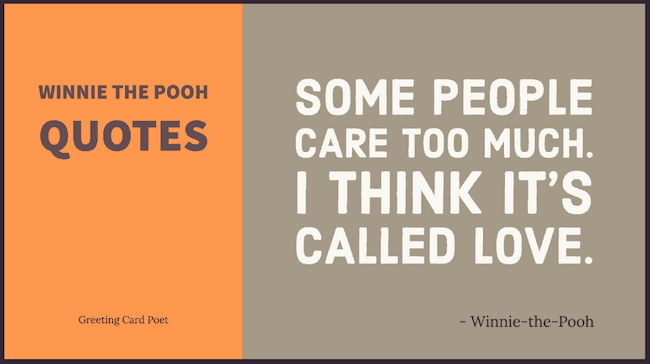 Tip: These Winnie the Pooh quotes make excellent photo captions and email footers. We will be friends until forever, just you wait and see. Just because an animal is large, it doesn’t mean he doesn’t want kindness. People who don’t Think probably don’t have Brains; rather, they have grey fluff that’s blown into their heads by mistake. Because although eating honey was a very good thing to do, there was a moment just before you began to eat it which was better than when you were. The hardest part is what to leave behind, … It’s time to let go! Think it over, think it under. 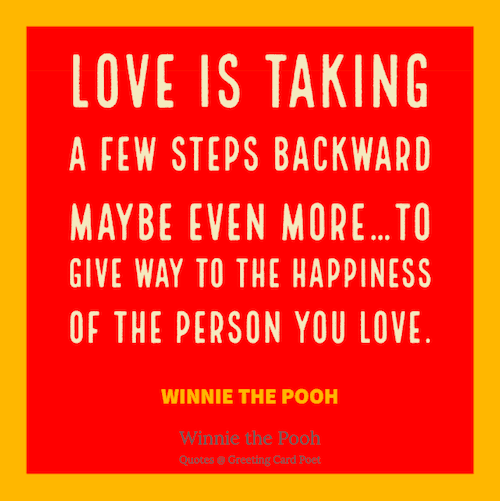 Love is taking a few steps backward maybe even more… to give way to the happiness of the person you love. I think we dream so we don’t have to be apart so long. If we’re in each other’s dreams we can be together all the time. How do you spell love? Pooh: You don’t spell it, you feel it. But the most important thing is, even if we’re apart… I’ll always be with you. Then would you read a Sustaining Book, such as would help and comfort a Wedged Bear in Great Tightness? When late morning rolls around and you’re feeling a bit out of sorts, don’t worry; you’re probably just a little eleven o’clockish. When you go after honey with a balloon, the great thing is not to let the bees know you’re coming. I ought to say, that it isn’t just an ordinary sort of boat. Sometimes it’s a Boat, and sometimes it’s more of an Accident. It all depends. On whether I’m on the top of it or underneath it. How sweet to be a Cloud Floating in the Blue! It makes him very proud To be a little cloud. When having a smackerel of something with a friend, don’t eat so much that you get stuck in the doorway trying to get out. Tip: Over 18 million folks follow Winnie the Pooh on Facebook. Maybe you’ll want to as well. It is hard to be brave, when you’re only a very small animal. Wherever they go, and whatever happens to them on the way, in that enchanted place on top of the forest, a little boy and his bear will always be playing. And really, it wasn’t much good having anything exciting like floods, if you couldn’t share them with somebody. She would know a good thing to do without thinking about it. And I’d say to myself as I looked so lazily down at the sea: There’s nobody else in the world, and the world was made for me. You can’t help respecting anybody who can spell TUESDAY, even if he doesn’t spell it right; but spelling isn’t everything. There are days when spelling Tuesday simply doesn’t count. Whatever his weight in pounds and ounces, he always seems bigger because of his bounces. But, after all, what are birthdays? Here to-day and gone to-morrow. Winnie the Pooh finds comfort in counting his pots of honey, and Rabbit finds comfort in knowing where his relations are – even if he doesn’t need them at the moment. And if anyone knows anything about anything, it’s Owl who knows something about something. One advantage of being disorderly is that one is constantly making exciting discoveries. I’m not lost for I know where I am. But however, where I am may be lost. Drinking your milk and talking at the same time may result in your having to be patted on the back and dried for quite a long time afterwards. A day spent with you is my favorite day. So today is my new favorite day. 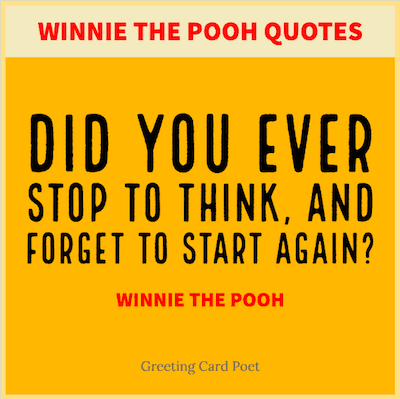 If you’d like to recommend some Winnie the Pooh quotes for our page, please drop us a line via the Contact page. Thanks!